looks like an even uglier version of the ugly angle play Charles cites above. Did I have a better play than ? Tapir: Try to imagine at one of the circled points. Andy: Actually, I think you were correct to tenuki with , however, I'd put this stone on the bottom side star point, instead of the top side star point. White's poor moves in the upper right will be punished naturally in the course of the game. There's no reason to get all excited right now about trying to stomp on these stones right away. fractic For I think is the best move. Something like the sequence to could follow. White still hasn't settled her group and black builds thickness to work well with his two hoshi stones at the bottom. 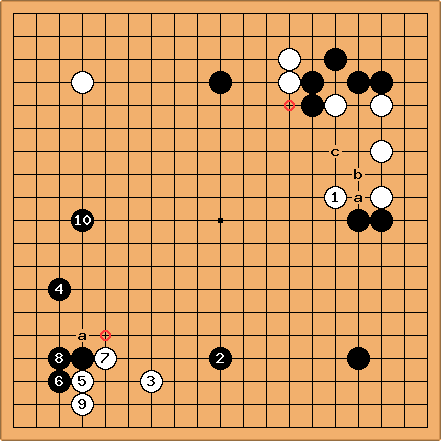 Image what a move like Black a would do to White's eyeshape. Tapir: To me it looks as if white plays bad first (giving thickness to black) but than tries to be light. (See in the next diagram) So she may play as answer on directly. fractic: He should play something like directly but Black can keep up the attack while making territory at the top. in the diagram is just extra thick. Andy Pierce: I don't like this diagram for black. Black has forced white to make good shape. 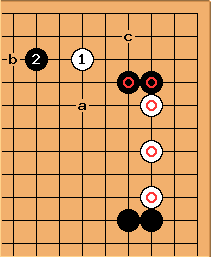 This diagram also suffers from having given black one extra stone (started with a black move, ended with a black move) that makes it look artificially good for black. To me, it looks like white is going to play at b and is alive. Black's empty triangle with to me says black can do better here. rokirovka: Thank you so much for the advice guys. One last question about fractic's last comment: If then directly, when you say keep up the attack while making territory at the top, do you mean with a play at the circled point for example? Or somewhere else? fractic: The circled point is on the fith line. That's a bit high. fractic: I was thinking about something like this. To Andy: yeah White b now looks a bit too good. How about at b trying to force? Response: I think the essential problem with here is that it is too much effort on the part of black to spend three stones trying to kill the single stone. All these stones are light for white so black can come to grief trying too hard to kill them. fractic: I just like the thick feeling of . Tenuki is possible of course. But I don't think white can claim to be very light. It's not like she can regard and as forcing moves. 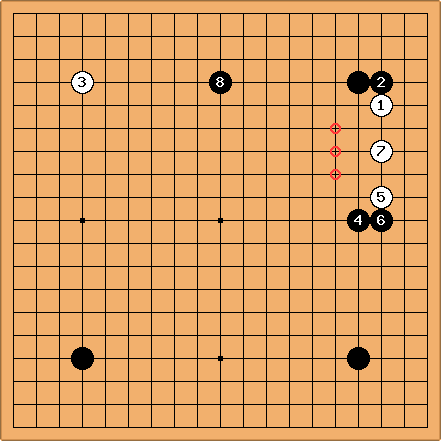 Andy: I agree that these white stones are very poor forcing moves. White can just regard these stones as straight-up mistakes (which they were) and abandon them altogether, rather than making them heavy and compounding her error. If I wanted to do something useful with these white stones, I'd use them to make a white play at a more effective in either undermine black's corner, or establishing a white position on the top. This is another reason why I don't like the move in the actual game high on the top middle star point. rokirovka: Thanks for your comments too Andy. 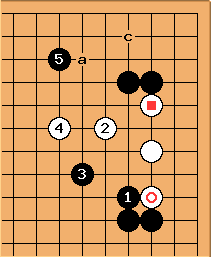 So if Black played tenuki on the middle bottom star point as you suggest, and then White played at a as you suggest, eyeing both Black's corner and the top side, how should Black react then? Defending the corner by playing at c is the first thing that comes to mind for me. Defending at c is not good, because you are strong. You should defend when you are weak. and are weak. You should attack, preferably with a move that attacks both weak white groups at the same time, namely, a splitting attack. You might try this directly with a move like a, but I would prefer to start with a pincer at . Now white is going to have trouble dealing with both of his weak groups at the same time. 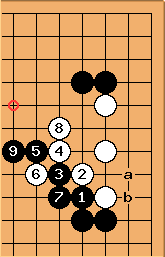 If white runs into the center with either group, you can chase with haengma from , and white saving his skin on one side just gets him into deeper trouble on the other side. Instead, if you play c to defend, you put no additional pressure on the stones with that move and white can easily settle with a move at b. That's my 3kyu worth anyway. Then a few moves later White plays here, which appears to violate everything read about basic instinct. "Even a moron connects against a peep," but here White gives me an open invitation to play at a. But I didn't, because then White can just block at b, and the stone behind it backs him up. So again I just took a big point elsewhere with instead of playing in the contested area on the right side. Was this correct? Then we played some kind of joseki in the lower right corner. I played conservatively with because I don't know this joseki and I wanted to avoid tricks and complications. Tapir: Don't fear! Better being tricked once, and being smarter the second time... Anyway, try to imagine at the circled spot. It is a nice forcing play, you can play some big point later (e.g. the other circled spot). fractic: I would play here protecting the corner while attacking . Playing as in the game gives White room in the corner to make eyes. Man, I thought after , this guy just loves the angle play no matter what. 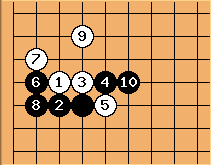 I blocked with , then played hane at the head of two stones with , just like "Basic Instinct" tells me I should. White cross-cut with . I didn't know what to do and decided to extend again from the crosscut with . Now, you guessed it, another angle play by White with , again inviting me to thrust between his stones. This time I did, with . After and , White played at a, but then my opponent had to leave and the game was cut short here. Did I play this right? It doesn't look right. I've seen similar angle plays in josekis in pushing battles along the side on the 3rd and 4th lines. I guess the rules about angle plays and allowing thrusts are different in these situations. My situation was even worse I suppose because I was pushing along the 5th line. Any good pointers about these situations (mine in particular and pushing battles along the 3rd and 4th lines in general) will be appreciated. Tapir: This guy is also 16k, so he makes lot of bad plays... however. , are fine, (deleted mis-advice here). If you don't want to push white, imagine at the circled point (white will answer at the squared point most probably). 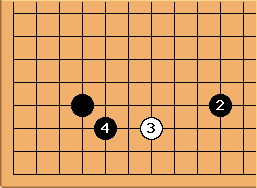 MrTenuki: Another idea: if you really want to play , consider reading out the sequence after as shown in the diagram followed by at b. If the cut at b doesn't work, then it's probably better not to play . fractic: Playing hane at the foot with and is also a good idea. It reduces the liberties of and and prevents white from doing the same. See hane at the head follow up.